Do not wish to take heavy or calorie loaded breakfast? 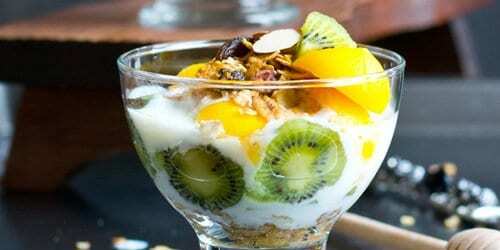 then “Yogurt Granola Parfait Recipe” for all diet and health conscious people. A filling yet healthy nutrient breakfast that can be made in minutes. Most prettier part is that you can make it ahead and can be refrigerator as well. This recipe is so versatile and can be altered as per your choice. Run your imagination to make it even more healthier and even more nutrient. 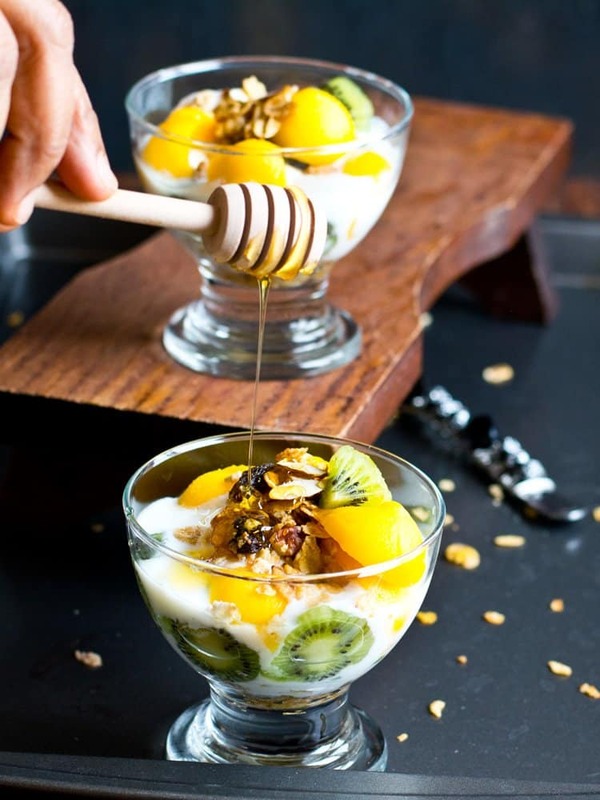 Like, you can substitute Vanilla flavored Greek yogurt with plain yogurt and add honey, the natural sweetener. This is one recipe, which does not make you to run to the stores to collect the ingredients. But can be found in every single kitchen’s pantry. Its early spring here, Its the time to shred few pounds which we have gained in this winter. We loved this recipe, as we found it very filling and not to mention very tasty as well. The procedure is very simple, like cut fresh fruits, add some yogurt and some granola and that’s it, you are done. It is very easy as like, even 8 year old can do it. The original Parfaits are usually made with whipped cream and served as dessert. But we have made some alters by keeping in mind to make it as healthier breakfast. I love to add available fresh fruits, but frozen fruits and canned fruits can also be added if needed. Assembling the dish is not that time consuming. But you can plan and make this meal ahead and store in refrigerator. Add Vanilla flavored Greek yogurt, add honey if needed. Hint: If you are using plain curd/Yogurt, add required amount of sugar/honey with few drops of Pure Vanilla extract. In two serving bowls, add granola. I have added homemade granola, but store bought granola also works fine. On top of granola, layer with yogurt as much as you need. Add another layer of kiwi fruit cuts. Again add a layer of Greek yogurt. Make another layer of mango cuts. I have made mango scoops, but mango chunks can also be added. 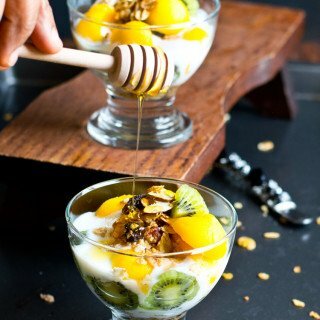 Over mango cuts add another layer of yogurt and followed by granola. Finally top with few fresh cut fruits. Serve immediately. Or refrigerate it for 30 minutes to 3 hours and serve chilled. 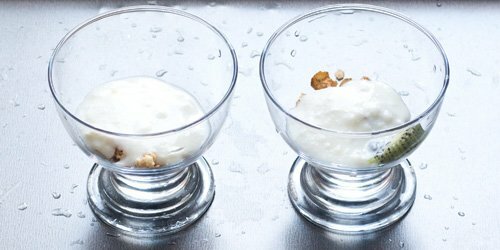 "Yogurt, Granola Parfait Recipe" for diet and health conscious people. A filling yet healthy nutrient breakfast that can be made in minutes. Most prettier part is that you can make it ahead and can be refrigerator as well. Add Vanilla flavored Greek yogurt, add honey if needed. 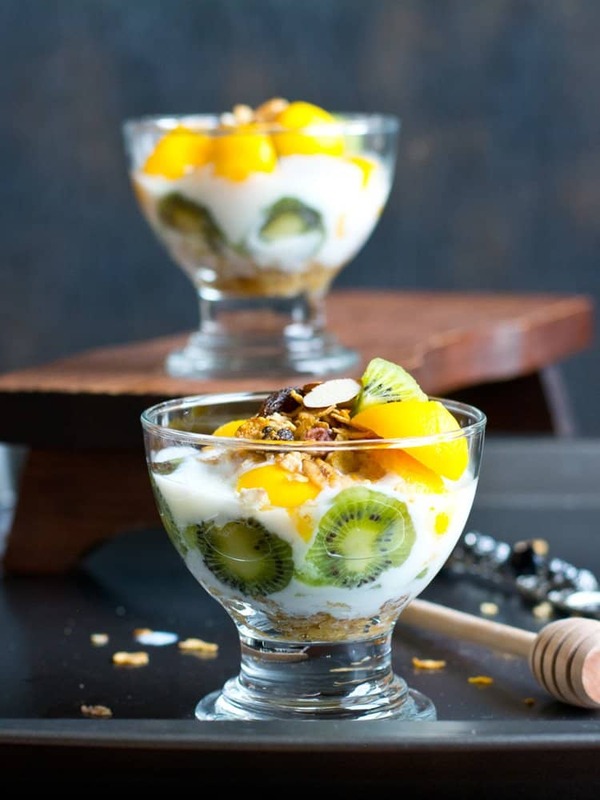 Over mango cuts, add another layer of yogurt and followed by granola. Finally, top with few fresh cut fruits. 1. 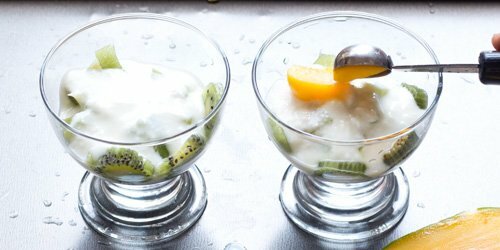 Add any flavored/plain yogurt to substitute Greek Vanilla Yogurt. 2. Add honey if needed. 3. Any kind of granola works fine. I have added homemade granola, but store bought one also works fine. 4. Fresh cut fruits can be replaced with frozen fruits as well. 1. Serve for breakfast or even can be had as snacks in between meals. 2. Serving chilled is the best for this recipe.